The Antiskid braking system is an essential part of a modern jet aircraft. There is a definite need for training aircraft maintenance technicians in this area. Hands-on training is the only effective method of training to ensure that trainees not only understand the theory but they are also well prepared to maintain the antiskid braking system in the best possible manner. Our Trainer Model AS-06 is an effective hands-on training system for antiskid braking system. 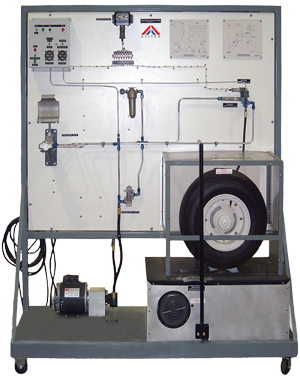 The Antiskid Brake System Trainer Model AS-06 includes standard hydraulic brake system plus the antiskid assemblies and components.The system is designed to meet or exceed the FAR requirements for instruction on aircraft anti-skid braking system. A manual, describing the principles of aircraft antiskid braking system and practice questions, is supplied with the trainer. Our trainers are supplied with a multimedia interactive CBT to enhance the training value of the equipment. The CBT explains the essential concepts in an easy-to understand explanation together with clear graphics and animations. The CBT also contains questions to test students’ achievement. The CBT is supplied FREE with the equipment.